« More New Fly Fishers! Weather has not been too bad, but certainly has room for improvement. Yesterday it maybe got into the 50s but we still had wind. Today we will struggle to get to the upper 40s, but not as much wind. Looke like upper 50s tomorrow then into the 60s through Saturday and 70s for Sunday and Monday. Could we be so lucky? Some chances for rain Wednesday, Thursday and Friday. So far the past seven days, we have seen non-stop generation. Today they started out with the equivalent of one unit and kicked it to two units, then three and back to two for most of the remainder of the day. We will see what tomorrow brings. We are at or almost at power pool (915.0 ft) right now. Last Thursday, Jim took Jim and his future son-in-law, Arthur our for half a day. Fair day for these guys on the big ruby and a brown SJ worm. Arthur is a new fly fisher, so there was a bit of instructional time. Friday, Carolyn took richard and his son, James out for half a day. 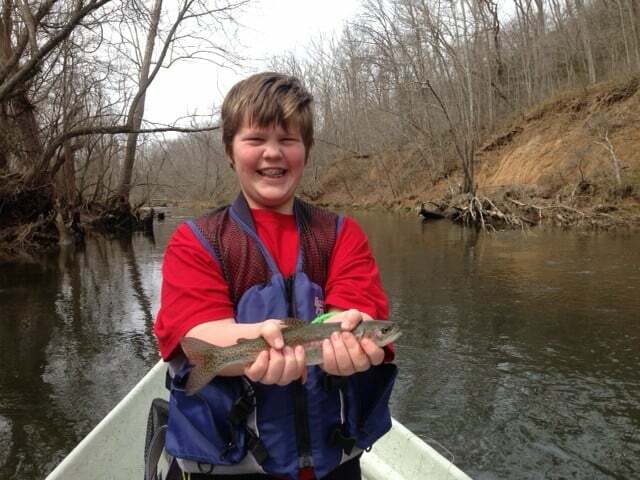 James is on Spring Break and they wanted to take advantage of the opportunity to go fishing! Glad to say, James is now a “fly flinger”. Caught his first rainbow on a black midge. Also doing a pretty good job of handling a fly rod. Richard and Thomas from Oklahoma spent all day on the river with Stan Saturday. They had a great day on the lightning bug. Fishing has been slow in the upper part of the lake with the colder than normal water temperatures. Stan took these guys into Turkey Creek where the water is warmer, and the bite was on. Quite a bit of company as lots of folks were fishing this area. Jim had Dale, and his daughter, Paige (who is on Spring Break) out for half a day. This was Paige’s first time with a fly rod. I believe she “pick and rolled” a few fish and got one into the boat. Cory and Brian from Kansas, spent half a day with Darrell. They had a slow day, but did catch fish on the big ruby and the black zebra midge. Sunday brought another trip to Turkey Creek for Stan as he took Scott and his daughter (yep, Spring Break) Emily, there to learn how and catch some fish. Fun day for Dad and daughter. This entry was posted on Tuesday, March 25th, 2014 at 1:27 pm	and is filed under Fishing Reports. You can follow any responses to this entry through the RSS 2.0 feed. You can leave a response, or trackback from your own site.